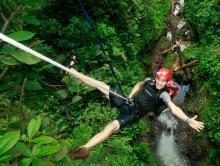 The Ultimate Adventure Honeymoon in Costa Rica! Canyoning, White Water Rafting... Put Adventure in Your Honeymoon. Looking for something a little more ‘adventurous’ on your honeymoon, but don’t want to sacrifice luxury and indulgence? 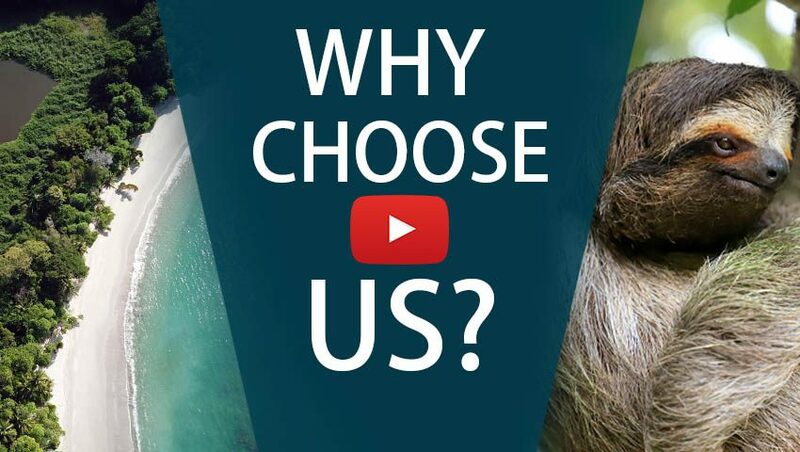 Then how about a custom Costa Rica vacation giving you the best of both worlds? Discover the hidden waterfalls of Arenal, soar through the tropical forests of the Pacific, and experience one of Costa Rica’s most exotic regions. Ignite the flames by staying in the country’s finest boutique hotels where you can give in to total relaxation! Who knew romance and adventure could be so good together? 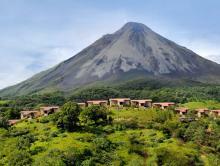 Enjoy the five-star Arenal Kioro with its own hot springs and set with perfect volcano views. From here the tours are limitless. 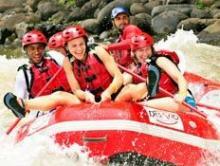 You can white water raft, zip line, kayak fish on Lake Arenal, or go canyoning. Your only limit is time! From Arenal head to Manuel Antonio and experience the delights of the Central Pacific at another beautiful hotel. To finish off your adventure, the final leg of your honeymoon sees you take in the splendor of the most biologically diverse part of Costa Rica, the Osa Peninsula. Have a honeymoon you will be talking about for the rest of your lives! 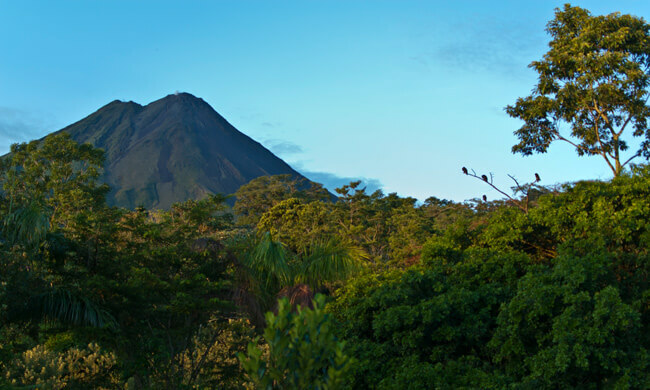 3 nights lodging at the Arenal Kioro—including one night FREE! 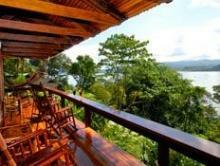 3 nights lodging at Aguila de Osa—including all meals! Your adventure honeymoon begins! Arrive in San José where one of our representatives will meet you and show you to your private transfer. You will travel to Arenal where you will stay at the Arenal Kioro hotel, a luxurious paradise with the absolute best views of the volcano in the area. Go on a canyoneering adventure tour. Discover Arenal’s most beautiful waterfalls in this adrenaline-filled tour. Try your hand at whitewater rafting on the wild Río Toro. See wildlife and gorgeous vegetation while you raft down the refreshing rapids. Don´t forget to make time to enjoy the on-site hot springs, perfect for relaxing after a day of adventure! Take a private transfer to Manuel Antonio where you will stay at Si Como No, a lovely boutique hotel with varied dining options and exceptional accommodations, including a movie theater! 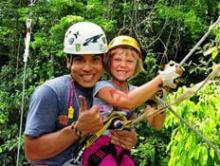 Go on a canopy tour, where you will soar through the jungle and see Manuel Antonio like few ever do. Spot titi monkeys, toucans, and colorful frogs. Relax in your suite or visit Manuel Antonio attractions like the national park. Don´t miss out on seeing the hotel´s Butterfly Botanical Atrium, crocodile lagoon, and amphibian jungle! A private driver will take you to Palmar Sur where you will catch your land/water transfer to the remote and eco-friendly Aguila de Osa Inn. Osa is one of the most richly diverse regions in the word, so use these days to explore its exotic jungles where you can see tropical wildlife, gorgeous plants, and experience nature up close. Included in your stay, you will explore the area on a hike through the Corcovado National Park—one of the most wild parts of Costa Rica. In addition, enjoy some world-class snorkeling around the stunning Caño Island. Take a domestic flight back to San José, where you will catch your flight back home.